They told me to expect a tickle, but it was really more of a pinch. I’m sitting alone in the bedroom of a suite at Las Vegas’ Wynn hotel, with an iPod Touch in my hand and a pair of electrodes stuck to my head. The electrodes belong to a small, head-mounted wearable device called Thync, which promises to improve your mood through short sessions of nerve stimulation. It’s launching later this year, and the Boston-based startup was showing how the technology worked at CES 2015. Twenty minutes of electrical currents to the face were hardly what I had in mind when I booked the appointment. When Thync announced itself last year, its website was full of vague promises instead of concrete details on the actual product. 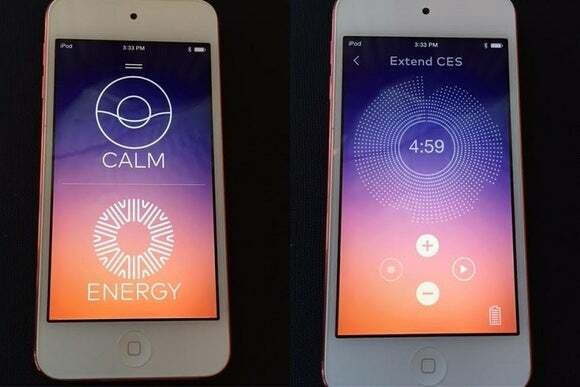 At CES, I expected smoke and mirrors—scented oils and new age music, perhaps—but instead was given a quiet bedroom and a plain hotel chair to sit in while Thync ran though its treatment. Before I began, Thync Executive Director Sumon Pal insisted that I was not going through any form of shock therapy, which induces seizures to treat psychiatric problems. Thync is more closely related to Transcutaneous electrical nerve stimulation, or TENS, he said. But instead of treating physical pain, as TENS usually does, Thync uses a different set of algorithms to make you more relaxed or energetic. Pal and several of his colleagues are neuroscientists, and they’ve spent a few years figuring how to beat a placebo effect. 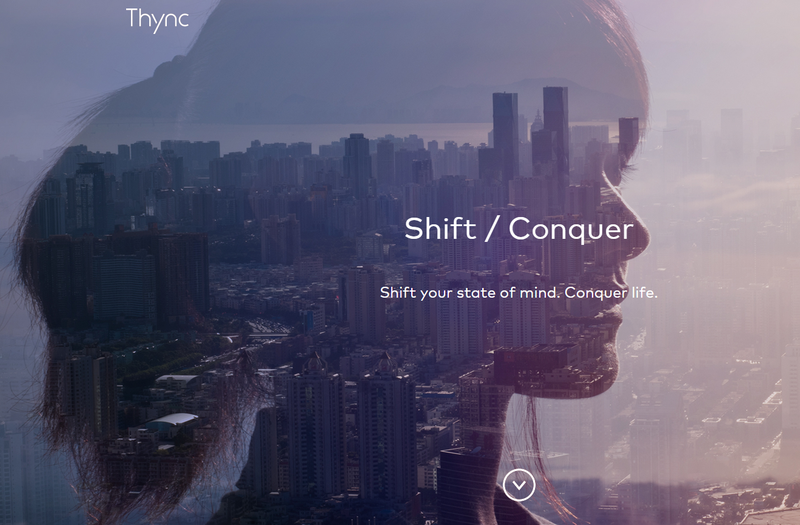 Part of the Thync.com homepage. Getting the treatment involves sticking one electrode behind your ear and another onto your temple, and enduring about 20 minutes of mildly uncomfortable currents. (A single device house the electrodes, battery, and Bluetooth transmitter, but Thync hasn’t revealed the final design and wouldn’t allow photos of the prototype.) You can control the level of these currents through Thync’s smartphone app, and while Thync employees told me to dial down the strength if I was feeling any pain, they also encouraged me to try and hit 75 percent strength by the end of the session. At launch, Thync will offer treatments for relaxation and energy, but plans to add other treatments such as self-control and creativity in the future. With two days of CES having sapped much of my mental strength, choosing the energy treatment was an easy decision. It doesn’t take long before I feel some discomfort, manifesting as a sharp-yet-weak pinch behind the eye. As instructed, I give myself a few minutes to get used to the feeling, then dial up the current by a few ticks. That’s when I realize the treatment itself is just warming up. Shortly after adjusting the current, a vibrating sensation kicks in behind my ear, as if someone had pressed a buzzing smartphone against my skull. But I stay true to the instructions, and increase the current level after a few minutes of adjusting to the sensation. When I describe my sharp eye-pinching sensation to Thync staffers, the looks on their faces suggests this is not ideal. There’s not much to do while the treatment is running its course, though the interplay between wanting to boost the electrical current and trying to stay reasonably comfortable is interesting enough on its own. Occasionally, a couple buttons pop up on Thync’s app that cause little variations in the current’s pattern, but it seems these are just diversions. Thync does plenty of its own oscillation between weaker and stronger jolts. About two thirds of the way through, a young man bounds into the room and asks if I’m feeling energized. I hadn’t really thought about it, as I wasn’t sure whether the effects were supposed to kick in before the end of the treatment, but at that point my answer is leaning toward “no.” This is CES, after all, and no amount of stimulation—not even a good cup of coffee—can keep a working journalist from craving a nap. I’m also thinking back to what Pal told me earlier, that roughly 25 percent of users don’t feel any significant effects beyond a placebo. (Thync tests this by giving some users a treatment that doesn’t actually do anything.) Five to ten percent of users don’t feel anything at all. Was I among the unaffected? There are worse bets to make in Vegas. Still, I press on with the treatment, using the last minute to push the current level nearly up to 80 percent. It feels good to finally rip the electrodes from my head, but when I describe my sharp eye-pinching sensation to Thync staffers, the looks on their faces suggests this is not ideal. At least no one can say I didn’t give it my best. But did I really get absolutely nothing from the treatment? I’m still not sure. After leaving the demo, the urge to nod off in a dark corner of the hotel hadn’t subsided, and the idea of sitting down to write did not appeal to me at all. Fortunately, the next event on my calendar was dinner with the PCWorld staff, and for someone running on less than five hours of sleep, I did feel especially lively and conversational throughout. I couldn’t tell you whether Thync’s treatment had anything to do with it, but at least it gave me something good to talk about.